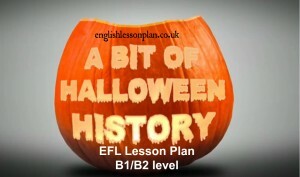 ESL lesson plan that focuses on the history of Halloween celebrations in the UK and USA. 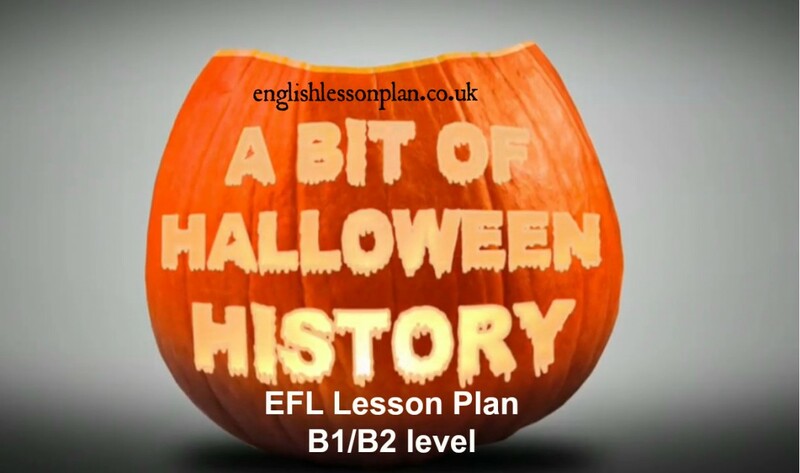 The video-based EFL lesson is designed not only to improve listening skills but also introduce the vocabulary related to Halloween customs. At the end of the lessons learners will have more insight into the traditions of this popular day and will be able to explain its origins. Ask students if they know which celebration they are going to talk today. Later tell learners to work in pairs to give the definitions/ meanings of the words. Elicit answers, show photos when necessary. 1. Which of the customs below are celebrated during Halloween? 2. What two things did people use to do at the night of 31st October? Why did they do it? b)….Answer: wear masks when they left home so that they were mistaken for fellow ghosts …..
a) A custom during which needy people offer their prays for dead relatives in return for pastry, such as soul cakes, is called …souling……….. .
b) A custom during which young people dress up and accept food, wine or money in exchange for singing , reciting poetry or telling jokes is called ….guising……….. .
Halloween has become a family-friendly, kid-centred custom in …1950s..………. . Since then it’s been growing in popularity all over the world. It’s estimated that on average US consumers spend round ….$2.5 billion …… on costumes annually, and the remaining on …candy………….. . Making it the second most commercial holiday after …Christmas……….. .
At the end of the lesson, ask your students to close all the notebooks, hand out a small piece of paper to each learner, tell them to write as many new words and traditions they remember from the lesson as possible. Then divide students into pairs (2-3 sts). Each pair chooses 4 most difficult words from the lists they have. Once students have written the words take the papers and prepare a quiz.